Bookings:Most of our gigs are for private functions, but some are for public community dances. We are currently taking bookings for 2019 and 2020. To book the band, just email us and we'll get back to you as soon as we can. If you are interested in booking us and want to hear our music, email us with the date in question and your postal address for a free 9 track demo CD. You can download some sound samples from the Band page . For the information of venues: we have public liability insurance and our PA equipment is PAT tested and approved. Below is a list of our upcoming public performances. 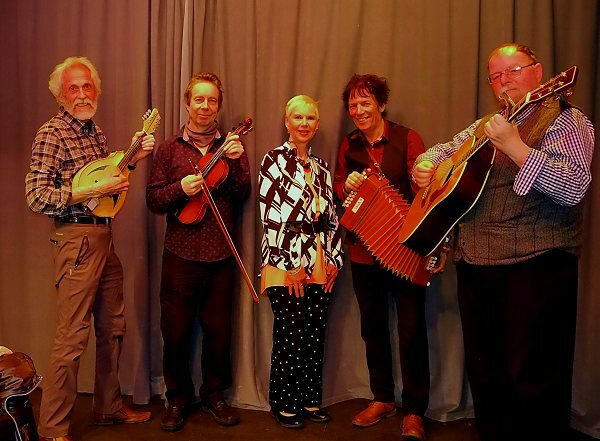 Most of our bookings tend to be for private events like weddings, anniversaries, birthdays etc., but we also play public ceilidhs and barn dances, so if you want to please come and join in the fun. Our forthcoming public events are listed below. "Most popular ceilidh band in North Wales" (and probably beyond) based on research of comparative demand for North Wales ceilidh bands. "Thankyou thankyou thankyou. Everyone said it was the best ceilidh they had ever been too. .. An event never to be forgotten for us all. Hope to see you again sometime." "We had a lot of our [wedding] guests who enjoyed themselves so much they are still talking about how much fun they had" - Letter from the bride six weeks after the event.